1. This photo of Lily Aldridge from her Instagram page. Turns out that this stunner model, and wife of Caleb Followill, is friends with my homegirl Taylor Swift. This all black ensemble screams Audrey Hepburn and needless to say, I'm obsessed. This year I have been particularly into flowers. I've pinned and reblogged countless numbers of photos of flowers, whether they be arrangements in vases, or growing wildly like the roses above. If you've read my past blogs, you would know that one of my goals for 2014 was to keep a flower alive. I had my lovely tulips that my roommate ended up killing. I went home for Easter break and asked my suite mate to water my flowers while I was gone, which she gladly obliged because she was going to be staying at school that weekend. My roommate constantly finds the need to lock our door and locked my suite mate out the entire weekend. The lack of water and sunshine completely killed my poor little guys. I've tried endlessly to nurse them back to health, but I think they're goners. 3. Speaking of flowers…these fashion designs made out of, you guessed it, flower petals. The über talented Grace Ciao has incredible fashion sketches on her website, as well as book illustrations. These sketches using flower petals to form the gowns caught my eye this week and I am completely in awe as to how someone could construct such beautiful drawings. If you think that these are good, I highly recommend checking out the rest of her sketches on the site. I've always enjoyed iced coffee from Dunkin' Donuts and Tim Horton's, but I've never been a fan of Starbucks coffee. One night, I decided to try an iced coffee because, well, why not? This was the single worst idea of my life because I cannot go a day without having my venti iced coffee. The Starbucks on campus is closed on the weekends, so I usually go Saturday and Sunday without it and well…I don't cope very well on those days. 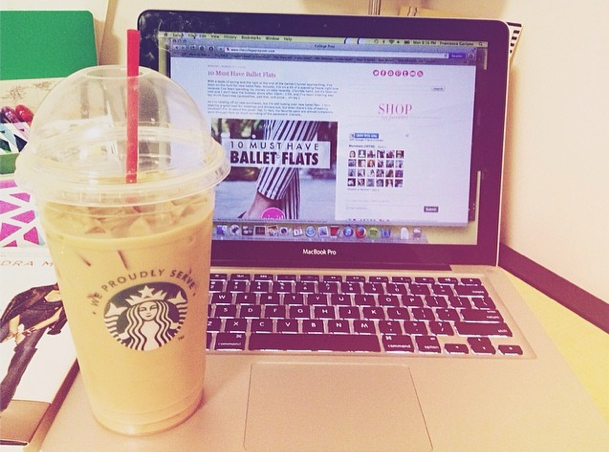 In addition to iced coffee, I've also gotten more into reading blogs lately. I've always read blogs, but it was normally just one or two at most. Now I've got a whole reading list that I read on the daily.